The Journal on Active Aging® is the indispensable tool that professionals seek to connect with the global vision of active aging along with everyday practical skills for promoting quality of life among older adults. Each issue is an engaging read for all segments of the active-aging industry: provider and supplier, CEO and instructor, researcher and manager. That’s because each issue—and each year of content— sweeps across the broad landscape of management and operations, marketing and communications, promotions and sales, programming, research, policy, and profiles of successful programs. Do you have a success story to share, or an academic discipline that has pertinent information for working with older adults? 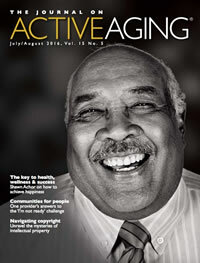 ICAA's Journal on Active Aging is authored by qualified industry professionals. The editors are always interested in learning about new article ideas and new contributors.